Dr. Mario Ramirez Elementary partners with AgriLIFE EXTENSION (Texas A & M System) to promote better health. The program is called "Communities Putting Prevention to Work 2011 Action Plan". The project will entail the following topics; Gardening Programs-increasing access to fresh fruits and vegetables, Hosting Farmer's Markets-Farm to School Programs, Physical Activity Programs - facilitating walking and exercising, Cooking Healthy Food Series/Demos and Building walking paths/tracks to increase access to physical activity. The proposed interventions include; community health fairs, free Zumba Classes, Walking programs -"Walk Across Texas" and 75 mile Club and much more. 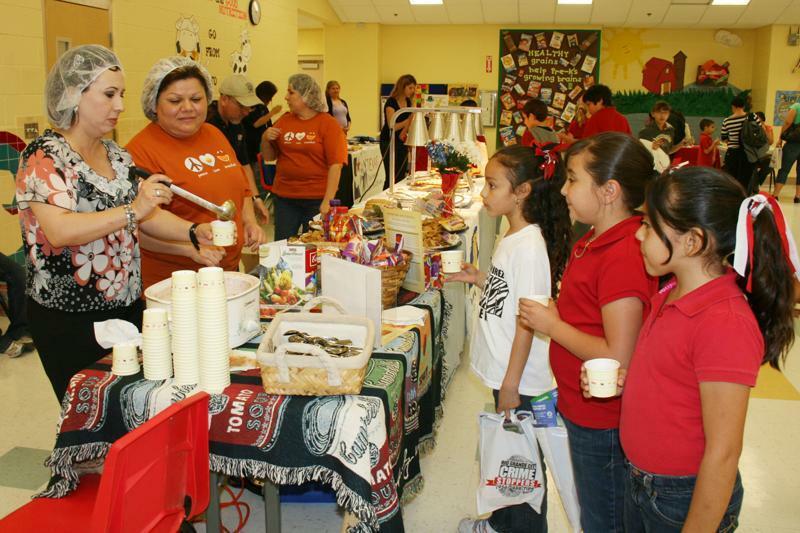 The program had a very successful kick off which included a Health Fair that featured information pertinent to all aspects of healthy living such as a mini food show by the RGCCISD Food Services Department , MAXIMUS/Texas Health Steps, South Texas Council on Alcohol and Drug Abuse, The Pediatric Care Center, Department of State Health, Rio Grande City Crime Stoppers, RGC Council Inc., RGCCISD Child Nutrition Services, Border Region MHMR, Texas Department of Health, Care Improvement Plans, Nuestra Clinica Del Valley, Starr County Memorial Hospital, Scan, Inc. Starr County Community Coalition, and Agrilife Extension Office Texas A&M System. Also preseent were Sales Reps from Keyimpacts, McCain, Readi Bake, Schwan, and Campbells. Denny's Restaurant of Rio Grande City Donated two gift certificates which were awarded to the the Best Decorated Booth. The certificates were awarded to The Pediatric Care Center. The Project Task Force Members include: Yolanda Moradoe-CEA-FCS, Rolando Zamora-CEP. EA, AgNr, Kelsey Hill - Health Specialist, Emiliana Guerra-Assistant Food Service Director-CNP Child Nutrition, Hilma Clark-Zumba Instructor, Adela Trigo-Principal, Dalinda Gonzalez-Counselor, Marvelia Barrera-Librarian, Lillian Maldonado-Teacher, Sixto Flores -P.E. Teacher, Mirtha Lozano-Teacher, Judy Ramirez-Teacher, Mauro Ruiz-Family Health Services, Diana Garcia - Nutritionist/Master Gardener, Grulla High School Agriculture and Wood Working Classes. Anyone who would like additional information may call Mrs. Lillian Maldonado-Instructor at Dr. Mario Ramirez Elementary who is the project coordinator at (956) 487-4457. (RGCCISD Photo).